Hundreds of people today paid home and tribute to Late Neelam Nido, former DFO, Baderdewa. Hundreds of people today paid home and tribute to Late Neelam Nido, former DFO and a social worker at his residence here during his last rite held today with all rituals and prayers. He dedicated his service in various parts of state which include Roing, Deomali, Shergoan, Khelong, Kimin and finally at Banderdewa. His last service was at Banderdewa as Divisional Forest Officer while take his last breath on October 14 last due to massive cardiac arrest at Hema Hospital, Itanagar at around 7.35 PM. Late Nido was an active social worker and was associated with several community and social welfare organisation of state and have been instrumental in various awareness programme in protection of wildlife and protection of flora and fauna of state. he was also actively associated with plantation of tree for green Arunachal and in 2018 itself under his imitative more than 20000 plants saplings were planted in Bassarnallo, Midpu, Cola camp, Banderdewa, PTC, Yupia, Sagale, Poma, Balijan and other parts of state. His work as social worker have always been praised and appreciated by all. He was associated with Riika Riibla Welfare Society (RRWS) as President since2013 to till date. Advisor of Lumri Natural Resource Committee. Hundreds of relative, friends and well wishers paid last respect and homage to the departed soul to rest in peace. All rituals and prayers were performed and was led to rest in peace at around 13-00 hours today. While Condolences the death of Late Nido Minister Environment, Forest, SJETA and DIA Nabam Rebia said that he was his friend and one of good forest officer who have always been advocating for protection of forest and wildlife. The society have lost a reformer. Former MP and APCC President Takam Sanjoy in his message said that Late Nido would always be remembered for his good works as an intellectuals, visionary and social worker. He become his relative through a matrimonial and understand his vision for protection of environment and plantation. Yachuli MLA Likha Saaya while termed him as a social worker and a fine gentlemen who have never criticise any one for any work. 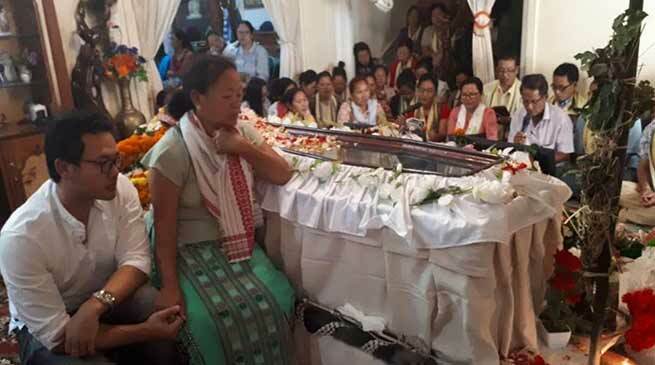 Itanagar MLA Techi Kaso said that he was one of his good friend and will be remembered for his social activities in the society and state as a whole. Several senior social, political and other leaders of state attended the last rite which include Bordumsa MLA NIkh Kamin, former Minister Talo Mugli, Lechi Legi, Neelam Taram, former MLA KIpa Babu, former IMC Deputy Chief Councillor Tarh Nachung, S&T Chairman Bamang Mangha, APSMPB Chairman B C Tok, DC Lower Subansiri Chukhu Takar, DC Papum Pare Dr. Joram Beda, senior officer Taba Tedir, Techi Tedi, Professor Tana Sowren, Ratu Techi, NL Kamin, Heri Maring, senior leader T C Tok, Toko Kach, businessman Nabam Tullon, Teli Tada and large numbers of local people, student, youth leader, family memebsr, relatives, well-wisher and others were present on the occasion.